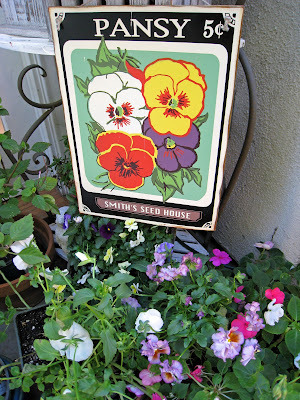 I am still planting my late fall and early winter pansies and can't seem to get enough of their happy little faces. 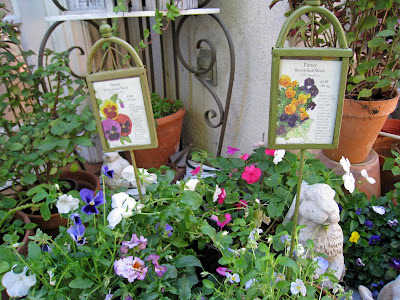 I found these darling Victorian seed holders at a garden store last year and thought the Pansy seed packets looked adorable in them (I think that they would make a cute little painting). Pansy painting inspired by my newly planted pansies. 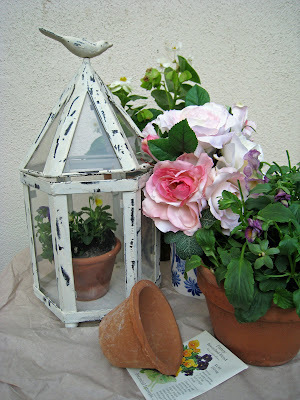 The garden cloche with bird on top was a little treasure I found in a vintage garden shop. 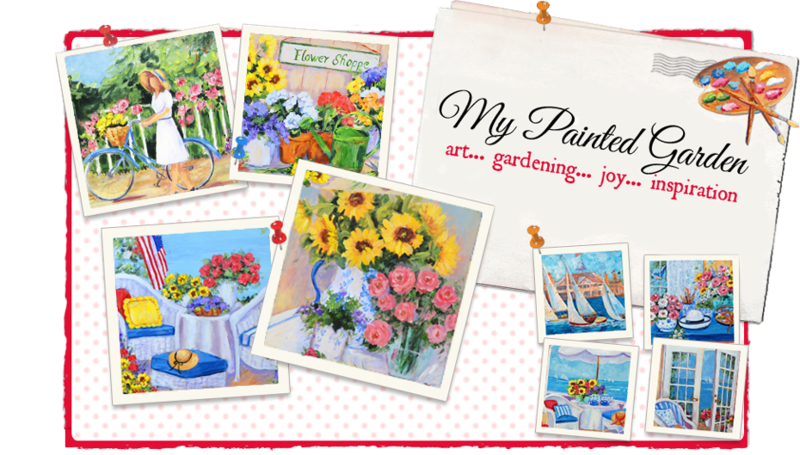 I really like it and have used it over and over in my garden paintings. This time I put a little pot of lavender pansies in the cloche. 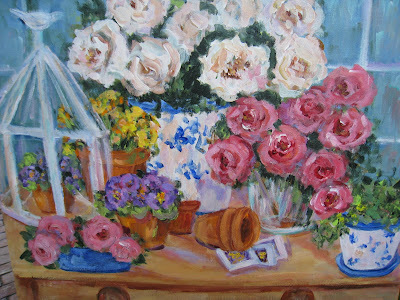 I like to arrange items together to get an idea of how they will look in the painting. I call this my "set up for inspiration". 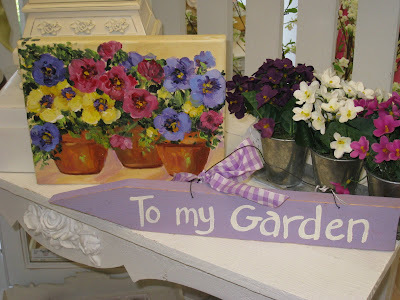 "Garden Day" painting with pansies and roses. 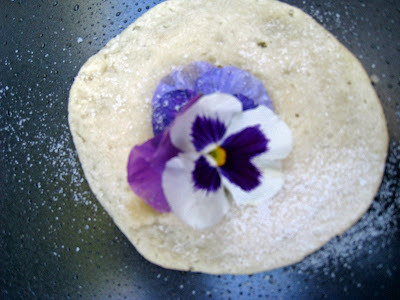 My Grandmother was an avid gardener and loved to use edible flowers, especially pansies, to decorate cakes and cookies. 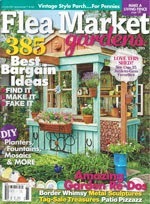 This year I planted pansies from seeds so I would have organically grown pansies to use in my baking. 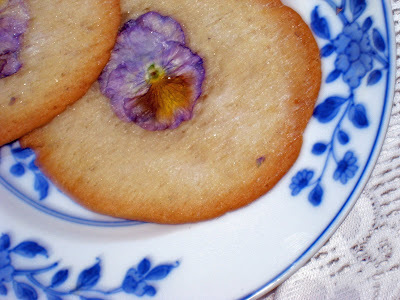 To make pansy flower cookies: use any standard recipe for sugar cookies - wash and dry culinary or organically grown pansy flowers and set aside - bake cookies for 5 minutes and remove from oven - lightly press pansy flower on top of cookies - sprinkle with sugar and bake until lightly browned. 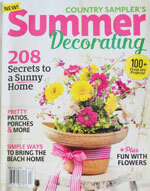 Flowers will come out lighter and have the subtle look of the pansy petal. 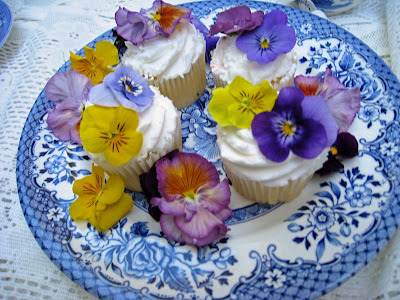 Mini cupcakes decorated with pansy flowers. Thanks as always for sharing your creative process and beautiful paintings with us. So beautiful and perfectly delicious looking! Im off to go through the rest! Everything is a FEAST for the EYES! Thanks for brightening my day! 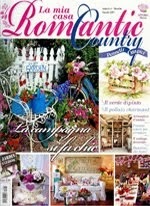 Your blog is beautiful and a very fun place to visit. Keep up the good work. Can we see more of yor studio assistant? He is darling. 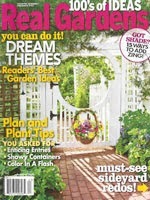 I love pansies too. 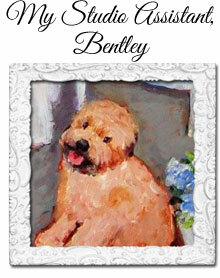 Your paintings are so wonderful! I just adore them! 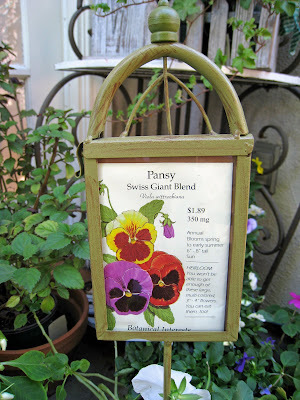 Gorgeous, this is the first I've heard of Pansy cookies. 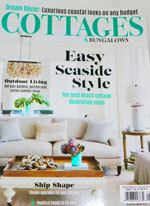 I am enjoying your blog. What a gorgeous post. I adore pansies. I'm jealous of your planting weather. I spent the morning scraping ice off of stairs.